Take advantage of our referral program. As a client, you are a vital part of our team & we love to reward you. So refer a friend, family, or a coworker who has never been to our Salon, you both will get a Free Tan with your purchase. Or you could choose to get $10.00 store credit towards any future purchases. After you have referred 5 new customers, you will get a month FREE Tanning or Red light Therapy, or 2 Body Wrap treatments or 2 Mystic Spray tanning sessions. Your choice, our pleasure. We MATCH any competitor’s price within 15 mile radius of the salon for a comparable service or product. Our tender loving care & superb customer service is just the icing on the cake. There is no pressure selling here. 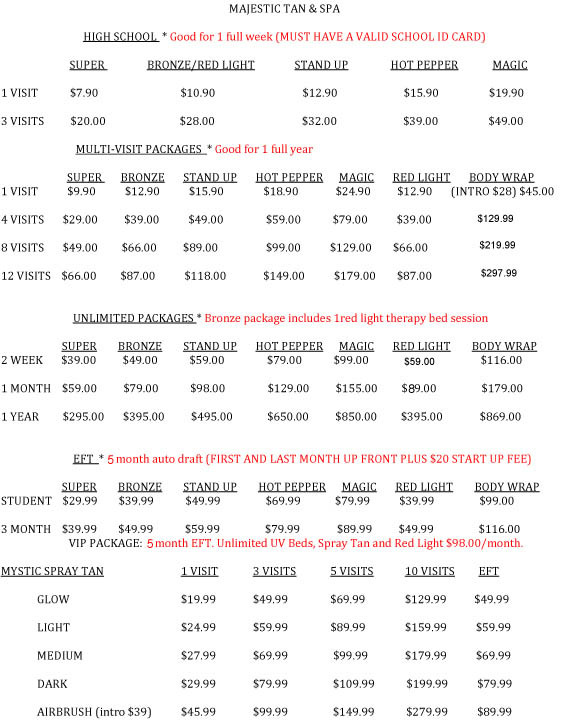 Although this price list looks busy, only a few lines will fit you based on your needs. We will suggest the best/lowest price that will satisfy your needs & goals. You can Tan for FREE year round with more referrals!